Some homeless people want to be left alone. Homelessness has long been recognized as a staggering social crisis in the Bay Area, but 2018 was the year it became a full-blown political and legal crisis. In Oakland — the epicenter of the East Bay's shelter crisis — homelessness was the top issue debated during the mayoral and city council races, and the city's leaders increasingly recognize the need to prioritize services and shelter for the unhoused. Surrounding smaller cities are also grappling with growing encampments and the obvious need to help the unsheltered. But while politicians argued over the best way to approach the sprawling tent camps and many housed residents complained daily on Nextdoor.com and to elected officials about homeless camps in their neighborhoods, unsheltered people increasingly pushed back against cities in 2018, especially against measures that they say punish and criminalize them for their pauper status. In Oakland, Mayor Libby Schaaf rolled out her major initiative last January: Tuff Shed camps where case workers assist residents in seeking transitional housing. With three camps serving up to 120 people at a time, and more camps planned for new locations, the Tuff Sheds are one of the more ambitious programs run by any Bay Area city to help homeless people. So far, dozens of homeless people have transitioned out of the Tuff Sheds into more permanent housing. The city of Oakland also took a major step this year by using Measure KK bond funds to purchase an old hotel on West Grand Avenue for $7 million. Renovated, the hotel will house up to 140 people at a time who will get one hot meal each day and have access to social workers who can help them obtain health care, long-term housing, employment, and more. And Oakland recently announced another foundation-funded initiative to prevent homelessness by providing legal representation for low-income tenants facing eviction. If it works, it could help hundreds of people a year avoid ending up on the streets. Still, many activists and homeless people criticize Oakland for not doing more. Some homeless people also say that cities like Oakland continue to punish unsheltered people by enforcing policies that make life on the streets needlessly difficult and hazardous. Camp closures, in particular, have become a contentious issue due to the fact that the number of unsheltered people far outstrips the number of shelter beds, making camping a necessity for thousands. The Tuff Shed program is now the subject of controversy because of how it's being deployed to justify closing existing, self-organized homeless camps, and to enforce camping bans in large geographic areas around Oakland, such as the perimeter of Lake Merritt. Nino Parker, a homeless resident and activist who leads a camp of elders on the southeastern edge of Lake Merritt, has emerged over the past year as one high-profile critic of the city's approach to the homelessness crisis. In October, Parker and others resisted the closure of camps across the Lake Merritt channel from the city's third Tuff Shed camp. Parker has also been organizing around programs to improve the lives of homeless people and lobbying for the city to directly pay the homeless to clean parks. Candice Elder, CEO of the East Oakland Collective, a group that organizes to provide resources at homeless camps, said the city homeless encampment eviction program has created chaos. "It's bad because each Tuff Shed camp can only hold 40 people while they evict an entire geographic area near the Tuff Sheds in which there's up to hundreds of other people. The homeless get scattered around the city." 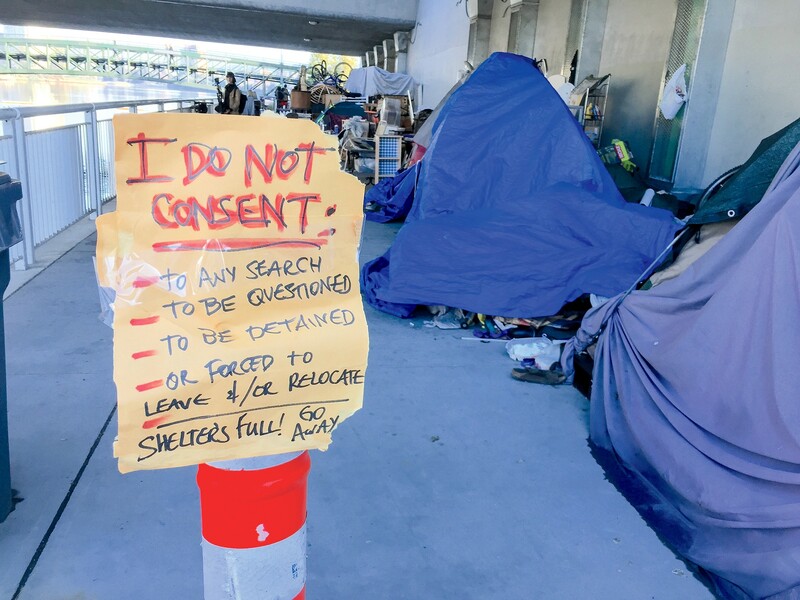 Elder argued that by closing down camps in the downtown and around affluent areas like Lake Merritt, the city has needlessly caused homeless camps to consolidate and grow, particularly in lower-income parts of Oakland. In Berkeley, homeless people and their allies have also been challenging the city's camp closures. "The city evicted us 17 times between October 1, 2016 and January of 2017," said Mike Zint, a formerly homeless activist, about a running conflict between one group of campers and the city over the past two years. The camp, which its members called itself "First They Came for the Homeless," continued to be evicted throughout 2018, even though its members had filed a federal civil rights lawsuit against the city alleging their constitution rights were violated. Last year, a federal judge dismissed some of the weightier legal issues in the case, but the lawsuit is still active. In September, the judge hearing the case allowed for the plaintiffs — several homeless Berkeley residents — to certify as a class to represent the broader Berkeley homeless community and pursue claims that the city has violated their Fourth and 14th Amendment rights by allegedly confiscating and destroying their property during camp closures. Another camp in Berkeley also protested the city's efforts to enforce a vehicle camping ban this past summer. In July, Berkeley's city manager ordered the owners of about two dozen RVs, buses, and other assorted vehicles to leave the Berkeley Marina parking lot or have their vehicles towed. The camp's residents organized against the plan and lobbied the city council to reverse course, but ultimately the parking lot was closed down to overnight camping. It was in Oakland, however, where the most contentious legal battle occurred this past year. In October, a group of about 14 homeless people took over a vacant and unused city-owned property in East Oakland and established a camp they named "Housing and Dignity Village." The city quickly notified the campers they were trespassing and that in 72 hours the site would be closed. Housing and Dignity Village was only the most recent incarnation of an intentional sober space organized by a group of homeless activists. They first coalesced in January of 2017 at Grove Shafter Park in North Oakland where they built makeshift tiny houses and an outdoor kitchen. Citing health hazards and complaints from neighbors, the city closed the camp, so the group next moved onto another plot of city-owned land on E. 12th Street at 23rd Avenue, next to an existing camp. "The Village," as the 23rd Avenue iteration of the camp became known, repeatedly clashed with city officials about whether they had any right to reside on this property or build structures. There were also several large fires at the location as more homeless people moved onto the site while nearby camps were closed down. By the time they ended up at their last location in deep East Oakland, the group was determined to make a stand. They filed a federal lawsuit on Nov. 9 claiming their constitutional rights against cruel and unusual punishment and due process were being violated due to the city's lack of shelter beds and the need for the homeless to live somewhere. For this reason, they argued that the city should be blocked from closing the camp. The lawsuit drew on the recently decided Martin v. Boise case in which the Ninth Circuit Court of Appeals found that laws that criminalize camping and sleeping in public, as well as other basic life-sustaining activities, are unconstitutional if a city lacks adequate shelter spaces for its homeless population. A federal judge granted a restraining order to temporarily prevent the city from closing the camp, but ultimately the judge disagreed with the Housing and Dignity Village and ruled that the city could follow through with the eviction because the city wasn't punishing the homeless camp's residents "for acts inherent to their unhoused status that they cannot control." Rather, the judge ruled that the homeless don't have a right to indefinitely occupy specific parcels of public property. The ruling led to a hasty and chaotic eviction on Dec. 6. Anita de Asis, one of the organizers of Housing and Dignity Village, said the lawsuit is still proceeding even though the camp was closed. The homeless residents say they still plan to show the judge evidence that the city's approach to homelessness doesn't respect people's constitutional rights. But regardless of what happens in court, de Asis predicted that homeless residents will increasingly agitate against camp closures and for the right to occupy public spaces as long as the city lacks adequate shelter. "Repression breeds resistance," she said. "The more they try to herd us into Tuff Shed camps or take away our sanitation or shuffle us around the city, the more people get agitated and ready to take this to the next level."